Outrun SEGA AGES on North America Switch scheduled for January 10th. As expected, looks like a great conversion. Puyo Puyo and its sequel Puyo Puyo Tsū have been announced. I believe that leaves two last announcements for the first wave of 15 games. that OutRun video looks super rad- i do kinda wish though they'd offer the set up as a collection instead of nickel-and-diming me. I bet Japan at the very least gets collections eventually. I hope M2 makes it import friendly if that ever comes to pass. I'm sure they well realize they have a lot of Western fans that both value their work and prefer physical releases. At least over on the 3DS, their menu system could be a bit confusing to me, so having it all in Japanese would make it even worse. Edited by Atariboy, Sun Dec 16, 2018 3:43 PM. They offer a Sega Genesis classics collection. It wouldn't have the Master System/Arcade games on there, and it's just straight up emulation rather than the tastefully enhanced versions we're getting here. But there is a lot of overlap of games between the two. I wouldn't be surprised to see a compilation somewhere down the road though. Kind of hard for me to get excited about it if it's just a straight port.. I really liked Outrun 2006 on the PSP so I'm wondering why they didn't revisit or evolve that a little. And even if we're just sticking to the original, the 3DS has its awesome port with 3D effects even. So it almost feels like stepping back. I dunno. Yes, it's very vanilla, but M2 style fancy artisanal vanilla with the bean specks and everything. There are the same tweaks to framerate and soundtrack as the 3DS remake, and of course it can run on the big screen now. The filters to make it look like an old, blurry, rounded CRT are very convincing to me. They added motion controls, but no HD Rumble, which is odd considering how force feedback was so important in the old game. They got my $7.50 (more like $5 after credits) because it's like the Saturn version, which I no longer have. Blue blue skies! I wouldn't call it vanilla. Short of a brand new selection of 15 courses to select from as alternates, it's hard to think of something that was missed here. Too bad that controller vibration is absent though, and the NS of course lacks a USB wheel/pedal accessory for M2 to support. I especially like the music options and think it demonstrates well how M2 goes above and beyond with their arcade conversions. 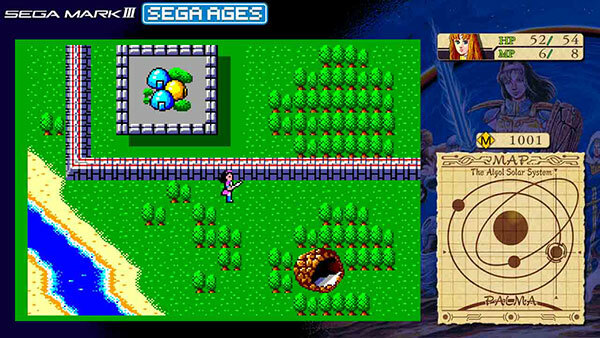 The three classic songs are here in all their glory of course (Along with a remix that combines them), as are the two songs created for the 3DS port But also included are remixes of Step On Beat from the Sega Genesis port, Midnight Highway from the Master System version, and Radiation from Outrun 2006. All are running of course through Outrun's original sound engine and sound great (Although like any good Outrun fan, I'll go with the original three tracks 99% of the time). Edited by Atariboy, Fri Jan 11, 2019 5:06 AM. "It's.not the sequel version" and "gimme physical media version" aren't fair complaints on this throwback machine IMHO. What makes M2's versions fantastic is that all the changes are done in a very tasteful way (I posted that on a status update) and can be disabled. They're not overhauling the game in some weird way. Edited by NE146, Mon Jan 14, 2019 3:11 PM. Yes, it's very vanilla, but M2 style fancy artisanal vanilla with the bean specks and everything. Seems like it has a few unlockables in there. I finished Course A and it unlocked "Steering Wheel Tune-Up" whatever that is. I'm not familiar with the original arcade version (which I think this emulates) but doesn't seem like the original would've had unlockables like that. One slight bummer that may have a "disable" option -- when I finished the course, the game was determined to upload my score to their leaderboards or something. No worries, usually, but since I wasn't near internet, to the best of my knowledge, I had to wait it to finish trying to connect and click through a few windows/errors to get past it. There are optional modifications that unlock with each goal. I haven't messed with them much on the 3DS version, but it's stuff like enhanced handling, some cosmetic customization like car colors, etc. Just got Phantasy Star. Is there any way to make it take up more of the screen? I don't care about the added stuff on the right that wasn't in the original. I wish you could add these games to your shelf in the Genesis classics game. It's weird to have that and then have all these games seperate on your switch menu. Also; some of these games were included in the PC version of Genesis Classics, so it very much so feels like we are being nickel and dimed here... Oh well at least they are available to play for those that really want to see them on a modern system. The Outrun port is fantastic and I do have it for Genesis and Saturn. This is the best modern conversion yet, mainly because of the music for me. The difficulty is cranked a little too high however. If you crash once on any setting except the lowest you can't make the end. Seems a little unforgiving. The easiest setting has not traffic, which makes it boring, unlike other versions which have traffic for the easy setting. All around hard to complain though; very nice job by M2. Can't edit my post above.. but some details for Phantasy Star: hit the "-" button for menu, then the X button for settings. The use L/R buttons to navigate to the Display settings where there are a bunch of options for display. You can even make it look like a curved crt almost . Edited by NE146, Tue Feb 12, 2019 7:54 AM. i just couldn't resist any longer and picked up Outrun (yessss, i know it's digital, lol). I am one happy race car game player- absolutely a perfect port! I really hope Galaxy Force II makes its way here- I had it on the 3DS and played the heck out of it.